Today's facilities manager must evaluate many alternatives to meet energy demands and must make sound decisions regarding large capital expenditures for plant additions and alterations. An understanding of basic heating and power plant cycles and equipment is essential. This chapter discusses the fuels, processes, and equipment of central heating and power plants. The discussion of fuels, fuel firing, boiler control, emission control, and operation applies generally to all sizes and types of boilers. Boilers are the basic building blocks of any plant system for the generation of hot water or steam. Whether fueled by gas, oil, coal, or renewable fuel sources, such as biomass, boilers are used by virtually every college and university. They may be located in a central plant or distributed among various campus buildings as package boilers. The energy derived from these boilers is generally in the form of steam or hot water. 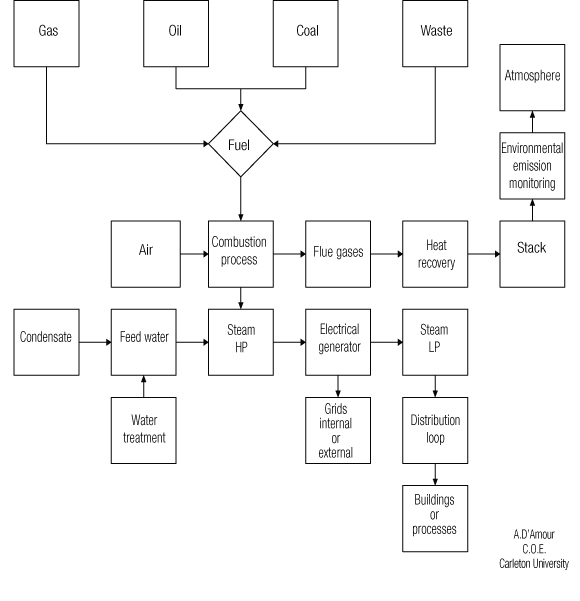 Hot water can be used to heat buildings directly or steam can be used to (1) generate electricity through turbine generators, (2) heat buildings with direct steam or hot water, (3) cool buildings with steam-driven centrifugal or absorption chilled water systems, and (4) provide steam for processes. To increase plant efficiency, a variety of auxiliary equipment is available, including economizers, air preheaters, feedwater heaters, and various heat exchangers, to maximize the use of the heat generated in the burning of fuels. In addition, other equipment, such as mechanical collectors, dust collectors, electrostatic precipitators, baghouses, scrubbers, and wastewater treatment systems, are often required to satisfy emission standards. Reliable performance of the plant system is critical to institutional operations. Efficient delivery of energy services to control operating costs is equally important. It is not uncommon for utility operating expenses to approach one-half of the facilities budget. For these reasons, the responsible facilities manager must devote considerable time to ensure reliable utility service at the least possible cost. This chapter will cover the fundamental operation and maintenance procedures that the facilities manager can use to maximize the inherent advantages of a central plant system and achieve cost-effective and reliable service. The basic power plant cycle and configurations for steam or hot water distribution are shown in Figures 1, 2, and 3. A central plant system has several economic and operational advantages. Less capital is required for equipment in a central location than in many individual buildings. Total install load will be lower because all connected buildings will not peak simultaneously. This relationship between the sum of the peak loads for individual buildings and the actual aggregate central system peak load is known as diversity factor. The installation of central standby equipment is more effective as compared to multiple standby equipment installations. Net assignable square footage for buildings is increased owing to the reduction of in-building machinery space requirements. Twenty-four-hour supervision by skilled operators is economically feasible. Noise is concentrated in a single location instead of at each building in a centralized plant operation. Operating and maintenance staffing costs are minimized because of the centralized equipment location. Increased efficiencies are possible with large heating and cooling equipment, which reduces operating cost per unit of energy output. Part-load performance efficiencies are substantially improved by the ability to meet the system load with the most efficient equipment. A single point of delivery for purchased utilities allows for favorable rates as a large-volume customer. Multiple fuel sources are a practical alternative. The use of multiple boilers allows the effective operation to respond to the coincident peak loads and through staging of the boilers efficiently respond to variable loads through the seasons. Standby equipment in central plant reduces the number of standby units that would be required in multiple plants and reduces maintenance costs. Initial construction cost requires a large capital investment. Thermal and hydraulic losses would be larger in a central distribution system compared to several point-of-use generation systems. Large systems may require compliance with more stringent environmental regulations. In Canada, these facilities must meet provincial legislation and regulations. Provinces are the governing bodies that set staffing requirements for operation of heating and cooling plants. In the United States, these facilities can be regulated by states or even by municipalities. A wide variety of fuels are used in central plant boilers. Primary fuels such as natural gas, fuel oil, and coal can be augmented with alternate fuels such as refuse-derived fuel (RDF), tire-derived fuel (TDF), bark or other wood products, petroleum coke, anthracite culm, and various manufacturing by-products. Each fuel must be evaluated on the basis of its availability and price as delivered to the point of use. Transportation charges at times can exceed the actual cost of the raw fuel. In evaluating fuels, consideration must be given to impurities in the fuel that may affect combustion performance or environmental emissions, as well as the variability in the higher heating value (HHV) of the fuel measured in Btus per pound. The HHV of fuels ranges from 23,500 Btu/lb. for natural gas to 4,000 Btu/lb. for anthracite culm. Ash and moisture content also must be monitored. In fluidized bed combustion, a limestone source must be secured that has adequate reactivity to remove sulfur from the flue gas efficiently. The normal range of heating values for various fossil fuels is given in Figure 4.
raise the temperature of 1 lb. of water 1°F. Combustion of all fuels consists of combining oxygen with carbon and hydrogen (oxidation) to release heat, carbon dioxide, and water. If there is a lack of oxygen, some of the carbon will not be completely oxidized, and carbon monoxide will be formed. Carbon monoxide is itself a fuel with a heating value of about 4,300 Btu/lb. Formation of carbon monoxide indicates incomplete combustion of the fuel. The products of combustion may also include nitrogen and sulfur oxides, which are regulated pollutants that can cause chemical fouling and corrosion of boiler equipment (Figure 5). The fuel must be gasified. The oxygen-fuel mixture must be within the flammable range. The mixture must be above its ignition temperature. Once the combustion process is started, the quality of combustion is determined by time, temperature, and turbulence. Good combustion is rapid, has a high flame temperature, and is turbulent. Turbulence is the key factor in effective boiler furnace combustion. If turbulence is high, mixing of the oxygen and fuel will be good, and combustion will be rapid and result in high temperatures. The specific amount of air required to complete combustion is known as theoretical air. In actual combustion, excess air is required, because the mixing of fuel and air is never perfect. The amount of excess air depends on the boiler type, fuel properties, and burner or stoker characteristics. Because excess air is supplied to the combustion process, all the available oxygen in the air will not be used. Excess air is a primary indicator of system performance. To determine the amount of excess air, first measure the oxygen or carbon dioxide present in the flue gas. Measuring oxygen is generally preferred to measuring carbon dioxide; the instrumentation is simpler and cheaper, and the oxygen-to-excess-air relationship is less variable than the carbon-dioxide-to-air relationship. An oxygen analyzer is used to measure the percentage of excess oxygen in combustion products. The excess air can be determined from the measured excess oxygen and known chemical composition of the fuel. Excess air requirements are stated as a percentage, as is the excess oxygen in the flue gas. Typical ranges for excess air are given in Figure 6. There are two basic boiler types: fire tube and water tube. Boilers may be further classified as either package or field-erected units, based on the manufacturing method and installation. A package unit is built, tested before shipment, and delivered as a one-piece unit requiring little field erection other than connection of auxiliaries. Field-erected units require field assembly of the various boiler components. Fire tube boilers have a shell that holds the water and tubes running the length of the unit. Flames and hot gases from the burner pass through the tubes, thereby heating the water. The boilers are manufactured in ratings that allow as much as 20,000 lbs. of steam to flow from the boiler in one hour at a maximum practical operating pressure of around 250 psi. The rating of these boilers is often given in terms of boiler horsepower, such as 600 boiler horsepower for a 20,000 lb./hour unit. One boiler HP is equal to 33445.6 BTUs (355286.78kj) at 100% efficiency. Most boilers however, operate at 70-90% efficiency. Fire tube boilers feature simple, rugged construction and have a relatively low initial cost. Their large water capacity makes them relatively sluggish in operation and slow to achieve operating pressure from a cold start. Several operational configurations can be used, depending on the number of times the hot gases are routed through the shell. Two-pass, three-pass, and four-pass designs are available. Additional passes increase the initial cost as well as the unit efficiency. Forced draft is normally used with multiple passes of the combustion gases (Figure 7). Regular maintenance is important to prolonging the life of a boiler. Boiler maintenance is a specialized field, thus, we are not going to go into great detail. Generally, though, daily, monthly, and annual maintenance is required for any boiler. What are some key aspects of boiler maintenance? Cleaning and servicing a burner to ensure its fuel-air ratio is correct and that it is burning in a safe manner is one. This affects both safety and performance. Oil burners require cleaning and servicing much more often than gas-fired burners. Especially with steam boilers, regular blowdown is necessary to prevent the buildup of solids. As water is heated and solids come out of solution, “surface blowdown” is required to bleed off some of the water in the boiler, removing impurities that rise to the water-level line. Blowdown also is done on the bottom of the boiler to keep sludge from forming. The buildup of solids and sludge reduces the heat-transfer capabilities, efficiency, and life of a boiler. Surface blowdown typically is performed with an automatic device. Bottom blowdown normally is a manual operation, one that requires adherence to a strict schedule. Heat recovery, by which heat is recaptured from water before it goes down the drain, can be added. With hot-water boilers, chemicals usually are introduced with a “shot feeder” installed around one of the circulation pumps. Once it is treated properly, a hot-water system requires very little maintenance. With steam boilers, chemicals normally are introduced in makeup water to help control scale and oxygen. Typically, chemical feed systems are automatic and used in conjunction with boiler blowdown. The trick is to use the right combination to minimize both the amount of chemicals used and the amount of boiler water going down the drain. Boiler water treatment is highly specialized; it is best left to experts. The power of a boiler is determined by the required steam mass flow rate, pressure and temperature. The amount of input fuel depends on the fuel energy content and on the overall energy efficiency. New boilers running on coal, oil, natural gas and biomass can reach efficiencies of 85%, 80%, 75%, and 70%, respectively. Boiler efficiency can be improved by preventing and/or recovering heat loss. The construction of a large industrial steam generator can take between 22 and 48 months depending on the scope and framework. A boiler’s annual availability ranges between 86% and 94%, including planned outage. Unplanned outages are typically very small or non-existent. The costs of steam generation are usually referred to as a system cost covering the entire boiler life cycle. For a full-load steam system (86%-94% utilization), the fuel cost accounts for 96% of the total life-cycle cost while investment, operating, and maintenance costs usually account for 3% and 1%, respectively. The cost structure clearly demonstrates that the energy efficiency is the main cost driver. © Copyright 2010 The Babcock & Wilcox Company. Image reproduced with permission of The Babcock & Wilcox Company. The initial cost of a water tube boiler is higher than that of an equivalent fire tube boiler, but efficiency is significantly higher and performance is much more responsive to load changes. Package-type water tube boilers are available in sizes up to 600,000 lb. of steam per hour. Above the 600,000 lb./hour rating, the units are generally field erected. Natural gas contains about 25 percent hydrogen and 75 percent carbon by weight. It is the cleanest burning and easiest to handle of all fuels. Products of combustion include water, carbon dioxide, hydrogen, oxygen, and nitrogen oxides. Many designs of gas burners exist, differing primarily in the orientation of burner orifices and their location in the burner housing. The use of oil (no. 3–6) is more complicated than the use of natural gas because of the preparation required. Solid foreign matter must be removed by straining. The oil is heated by tank and/or flow line heaters for lower viscosity and must be atomized before mixing with combustion air. A gun introduces the oil into a burner in a fine spray. Light oil (no.1–2) can also be used. No heating of the oil is required, but tanks have to be sheltered from wind to prevent the oil from turning to a gel in cold weather applications. Steam atomizing or mechanical atomizing can be used with this type of fuel. The capacity of the boiler will dictate which type of burner is to be used. For instance, on low-capacity boilers, mechanical atomizing is the norm. Products of combustion include water, carbon dioxide, nitrogen, oxygen, nitrogen oxides, sulfur, and particulate matter. The particulate matter sticks to tubes and boiler surfaces and leads to boiler fouling if these surfaces are not cleaned regularly. Sulfur oxides combine with water to form sulfuric acid, which can cause boiler corrosion. In a coal-burning system using stoker/grate firing, air is supplied to the combustion process in two stages. Primary air is introduced under the fuel bed, and overfire air, or secondary air, is introduced above the bed. The oxygen content of the primary air rising through the fuel bed is consumed, forming carbon dioxide. A portion of the carbon dioxide rising through the fuel bed is converted to carbon monoxide by reacting with the carbon content of the fuel. This combustible gas passes into the combustion space above the bed where overfire air is admitted. Here the combustion process is completed. As a general guide, about half the air by weight is supplied below the bed and half above the bed. The rate of burning is controlled by the primary air, and the completeness of combustion is controlled by the overfire air. The products of combustion vary with the grade of coal but include carbon, hydrogen, nitrogen, oxygen, sulfur, moisture, incombustible materials, and nitric and sulfur oxides. When fossil fuels are burned, nitric oxide and nitrogen dioxide are produced. These pollutants initiate reactions which result in the production of ozone and acid rain. The nitrous oxides (NOx) come from two sources: high-temperature combustion (thermal NOx) and nitrogen bound to the fuel (fuel NOx). For clean-burning fuels like natural gas, fuel NOx generation is insignificant. In most cases, NOx levels are reduced by lowering flame temperature. This can be accomplished by modifying the burner to create a larger (and therefore lower temperature) flame, injecting water or steam into the flame, recirculating flue gases, or limiting the excess air in the combustion process. In many cases a combination of these approaches is used. In general, reducing the flame temperature will reduce the overall efficiency of the boiler. However, recirculating flue gases and controlling the air-fuel mixture can improve boiler efficiency, so that a combination of techniques may improve total boiler efficiency. In all types of stoker boilers, the fuel is burned on a moving mechanical grate. These grates are available in several configurations, including stationary or dump grate, chain grate, traveling grate, vibrating grate, and spreader stoker. Each type of grate has been developed to optimize the use of specific fuels such as coal, wood products, or municipal waste. Chain grate and spreader stoker boilers are the most common for coal-burning units rated at 200,000 lb./hour steam flow or less. Mechanical stoker boilers can handle a wide variety of fuels. Response to load changes is moderate, as there is a large supply of fuel in the bed at any time. Overall unit efficiencies of 80 to 82 percent can be expected (Figure 9A). In pulverized coal boilers, grinders (pulverizers) are used to reduce the coal to a fine powder. Coal is supplied to the pulverizer in various sizes ranging up to 2 in. The pulverized coal is then dried and classified before being conveyed into the boiler by a combustion air stream. Three of the most widely used pulverizers are the ball-and-tube type, the ball-and-race type, and the roll-and-ring type. Pulverized coal burners are similar in design to oil-fired burners, and combustion is similar to that of gas. Combustion temperatures can reach 2,000°F. At these temperatures, many coals form ash deposits and slag that can build up in steam-generating sections of the boiler. Response to load change is rapid, and overall unit efficiency is high, approaching 86 percent (Figure 10). Use of fluidized bed boiler technology is growing in North America. This method of combustion burns the fuel in a turbulent atmosphere, generated by combustion air entering at the bottom of the furnace in the presence of limestone, which absorbs the sulfur. The fuel may be either contained in an agitated bed or completely suspended by air, depending on the unit design. Two advantages of using this method of combustion are the removal of sulfur (and thus compliance with environmental standards without additional equipment such as scrubbers) and the ability to use a wide range of fuels. Two primary types of fluidized bed boilers are available: bubbling bed and circulating type. Bubbling bed boilers are considered to be the original fluidized bed boilers. They have a relatively low velocity of combustion air moving fuel through the bed. Most bubbling bed boilers have heat exchange tubes inside the fuel bed to absorb the heat of combustion from the fuel. An inert material, such as sand, often is added to the fuel bed with limestone to achieve the desired interaction between the fuel and inert materials. The fuel bed material is typically 4 to 6 ft. in depth in a bubbling bed design. In the circulating-type boiler, combustion air velocities are increased such that a definable bed is not experienced. Rather, the fuel is completely suspended by air or is air entrained. As the bed is dispersed, the fuel is more evenly distributed throughout the volume of the combustion chamber. Better fuel utilization and increased heat absorption in the combustion chamber walls mean that in-bed tubes are not required. These boilers are smaller in size and have a higher combustion efficiency than bubbling bed units. All fluidized bed boilers have the capability to handle a wide variety of fuels. They can handle feedstocks such as coal, RDF, wood waste, agriculture product waste, anthracite culm, petroleum coke, or any combination of these fuels. Response to changing load demands is rapid, approaching that of the pulverized coal boilers. Overall unit efficiencies of 86 to 87 percent can be expected (Figure 11). Waste heat boilers are used in many cogeneration facilities. This type of combustion uses the hot gases from another process, such as exhaust gases from a gas turbine, to transfer heat to steam generation banks. The gas stream may or may not have fuel content. Sections of these boilers are typical of any of the boiler types previously mentioned. Usually a supplementary fuel, such as oil or gas, is required to maintain a constant furnace temperature. Cyclone boilers use one or more small combustion chambers attached to a conventional furnace and steam-generating section (convection pass). These small combustion chambers are operated with a turbulent atmosphere at high temperatures. Slag is intentionally formed in the combustion chamber and drained out of the cyclone area. This boiler design results in reduced furnace size and the ability to burn a large variety of fuels owing to the turbulent combustion chamber. These boilers produce high levels of nitrogen oxides (NOXs) because of the higher combustion temperatures. Three factors can inhibit heat transfer to the steam and water contained in the boiler, resulting in lost energy: combustion factors, heat transfer factors, and steam loss factors. Losses associated with combustion fall into three categories: flue gas losses, combustible losses, and radiation losses. Exhaust gas waste heat exists in two forms: dry gas loss and moisture loss. Dry gas loss is the unrecovered sensible heat energy contained in the hot flue gases, excluding water vapor. Moisture loss consists of both latent and sensible heat of the water vapor resulting from the combustion of hydrogen and any moisture present in the fuel or combustion air. Two methods are used to reduce flue gas losses. One method is to reduce excess air to a minimum. Reduction of excess air reduces the amount of air in the flue gas that can absorb heat. Flue gas velocity is lowered, and heat transfer to the water or steam is increased. Excess air can be reduced by better mixing of the fuel and air. A second method to reduce flue gas losses is to increase heat recovery from the flue gases. Care must be exercised, however, in reducing stack temperatures in boilers that have economizers, air preheaters, and other auxiliary equipment, because reduced stack temperatures may lead to condensation of water vapor. This water vapor can combine with sulfur to form a corrosive acid in the equipment or the stack (<265°F). Incomplete combustion is evidenced by solid combustibles in the ash, carbon carryover in the fly ash, the presence of carbon monoxide in the exhaust gas, and unburned fuel. Methods used to correct this condition for each fuel type follow. Carbon monoxide is the only combustible product normally formed in the combustion of natural gas. Carbon monoxide results from too little or too much excess air, from insufficient fuel-air mixing, or from flame impingement on cold water walls. Care should be taken to ensure that the burner is operating in the acceptable excess air range, that diffusers and other mixing equipment are operating properly, and that the flame shape prevents impingement. Carbon monoxide is formed during the combustion of fuel oil, as it is for natural gas, and the corrections are the same. In addition, the formation of carbon monoxide may result from improper oil viscosity and inadequate atomization. These conditions can be corrected by checking and adjusting the oil temperature and the operation of the diffuser and atomizer. Carbon monoxide and carbon carryover may be formed by the same factors that affect combustible formation in natural gas and can be corrected in the same way. Incomplete combustion can result from variations in coal sizing. Generally the coal must be pulverized so that 70 percent will pass through a 200-mesh screen. Without careful monitoring, carbon monoxide and smoke may be formed by too much or too little excess air or during low-load periods. Correcting the supply of excess air, increasing overfire air velocity, and shifting loads from other boilers may overcome the problem. With stoker-fired coal, solid combustibles are always present in the fly ash, but the amount of unburned material can be reduced by reducing the excess air. Carbon carryover can also be diminished by fly ash reinjection, but reinjection will normally increase the particulate loading at the stack. Carbon monoxide, carbon carryover, and clinkering (solidified slag) may also result from too many fines (undersized coal), wet fines, insufficient bed thickness, improper undergrate air distribution, or improper feeder adjustments on spreader stokers. Plant engineers should check for proper combustion conditions. Radiation loss results from heat that escapes through the boiler shell. This loss constitutes a higher percentage loss in low-load conditions and with smaller boilers because of the increased surface-to-volume ratio. Radiation losses can be cut by ensuring that both the boiler jacket and breeching are in good condition. Deposits inside and outside the heat transfer tubes act as insulators that impede heat transfer. When deposits accumulate, the water or steam is able to absorb less heat. Deposits can be detected by monitoring flue gas temperatures; rising temperatures indicate that less heat is being transferred in the boiler and more is being lost to the stack. Improper combustion can speed soot deposits on boiler tube surfaces. Several steps must be taken to counteract buildup. For example, water tube boilers should be subjected to frequent soot blowing, sometimes as often as three times a day. Water side deposits can be controlled by effective water treatment and by mechanical or chemical cleaning. Steam losses can result from faulty steam traps, leaks to the environment from drains and vents, and inadequate insulation of steam lines. Of the three, malfunctioning steam traps are probably most significant. A variety of tools exist for detecting faulty traps, such as temperature- indicating crayon, temperature-actuated color-changing tape, surface temperature gauges, and ultrasonic detectors. Pipe insulation is determined when steam lines are installed, based on cost-effectiveness. However, increases in energy costs change the incremental cost-benefit relationship, and at some point it may be cost-effective to add insulation. A variety of auxiliary equipment may be added to the basic boiler system to recover heat and increase overall unit efficiencies, normally in the range of 3 to 8 percent. The most common auxiliary equipment, heat exchangers, increase the temperature of either the water or air supplied to the boiler. Since each installation is unique, no attempt has been made to quantify the potential savings realized by increased efficiencies when auxiliary equipment is added. Any analysis of potential savings must take into account equipment configuration, steam characteristics (pressure and temperature), purchased power costs, and fuel costs. Qualified engineers must study each power plant to determine efficiency improvements through the addition of auxiliaries. The most commonly used auxiliary to increase unit efficiency is the economizer. The economizer transfers heat from the flue gases to the boiler feedwater. Flue gases are passed through a heat exchanger (economizer) as they leave the steam-generating section of the boiler. Most economizers operate at a relatively low temperature, thus requiring a large heat exchanger surface area. An expanding variety of federal, state, provincial, and local environmental regulations and restrictions govern power plant emissions. Jurisdictions vary from region to region, but any major plant addition or modification is likely to require oversight and approval from any or all of the regulating agencies. Mechanical collectors are used to control particulate emissions. These collectors change the velocity and direction of the gas stream sufficiently to allow the heavier particulates to fall into a hopper below. Mechanical collectors can be used to collect large amounts of particulate matter, often in series with other pollution control devices. Many mechanical collectors use a tube design whereby each tube is an individual centrifugal dust collector. Particulate matter is collected through cyclonic action created by turning vanes on one end of the tube. Collector tubes range in diameter from 6 to 24 in. Mechanical collectors have no moving parts and are characterized by a low drop in pressure across the unit. They do, however, require maintenance, because they must be kept clean to operate correctly. Their collection efficiency depends on the size and weight of the particles; they are more efficient in removing heavier particles. Mechanical collectors can remove up to 90 percent of all particulates. Electrostatic precipitators often are used when collection efficiencies of 99 percent or less are needed. Electrostatic precipitators give an electrical charge to the particles in the gas stream and then attract those charged particles to a collecting electrode. The electrostatic precipitator's electrical field operates at a high DC voltage level (typically 50,000 to 75,000 V) imparted to a framework of weighted wires. The charged particles are collected on electrically grounded suspended plates. These plates are rapped or vibrated mechanically to remove the fly ash to a storage hopper. Performance is a function of the chemical constituents of the coal and the electrical characteristics of the fly ash. Efficiencies will be notably higher when burning higher sulfur coals. A properly designed precipitator requires full definition of the fuels to be burned. One of the most efficient methods of particulate removal is the bag house. Bag houses can remove more than 99 percent of all particulate matter and are smaller and less expensive than a comparable precipitator. A bag house removes the fly ash from the boiler exit gases by passing the exhaust through fabric filters. Collection is allowed to continue until the pressure drop across the bag house reaches a predetermined level, at which time the bags are cleaned. The ash cake formed on the fabric also acts as a filter, so that maximum collection efficiency occurs immediately prior to cleaning the fabric filters. Federal, state, and local environmental regulations require most new boilers to have gaseous emissions limitations. Gaseous pollutants are more difficult to manage than particulate matter. The most common restrictions apply to sulfur and nitrogen emissions, but many installations are also regulated for trace elements, heavy metals, organic compounds, and other toxic emissions. The most prevalent pollutant is sulfur dioxide. The sulfur oxides can be controlled by removing sulfur prior to or during combustion, as with fluidized bed combustion. The primary method of removing sulfur from the boiler exit gases is with scrubbers. A wet scrubber system removes sulfur dioxide from the flue gas by introducing limestone slurry into the flue gas stream in a spray-type chamber. The atmosphere within a wet scrubber is much like that in a wet cooling tower. A wet scrubber system is characterized by high water usage, large quantities of waste materials, and high operating costs. If sulfur recovery is desired, a magnesia solution is substituted for the limestone slurry to recover a sulfur product. Nearly 90 percent of all sulfur oxides can be removed with wet scrubbers. One type of dry scrubbing, the spray dryer system, uses lime reagent that is atomized and mixed with the incoming flue gas. The lime droplets react with the sulfur dioxides in the flue gas and are simultaneously dried. The spent solids are collected in the bottom of the absorption chamber. The dry scrubber system is advantageous because water usage is minimized, waste drying is unnecessary, and a dry fly ash conveying system can be used to handle wastes generated. Another type of dry scrubber removes sulfur dioxide from the flue gas stream by passing the flue gas through a fixed absorbent bed material such as char. The absorbent bed material is regenerated once the material becomes saturated. To demonstrate compliance with state, provincial, federal, and local emission restrictions, it may be necessary to add gas analyzing equipment to the boiler. The complexity of the equipment and the reporting requirements will vary depending on the regulating agency. Equipment costs range from $25,000 to $200,000 per boiler installation. Opacity monitors measure particulate emissions from a specified source. Although the boiler exit gas would certainly be one source, other equipment, such as coal-handling dust collectors, ash blower exhausts, or any other dust-laden particle stream, may require monitoring to ensure compliance. The regulating agency often requires continuous emission monitors (CEMs) after any significant plant modification or addition. These monitors provide extensive analysis of the flue gas stream for sulfur dioxide, nitrogen oxide, dilutive gases, or other regulated gaseous emissions. A typical CEM system consists of a gas sample point, gas analyzers, and data reduction computers with output devices. The three basic types of continuous emission monitors are in situ, extractive, and dilutive extractive. The in situ device is mounted at the point of collection on the gas ductwork or at the chimney. The analyzers are mounted at the sample point and the data reduction hardware at some remote location. The extractive system extracts a flue gas sample and transports it to a remotely located analyzer cabinet, where the data reduction equipment is also located. The dilutive extractive system suctions the flue gas through a metered orifice to provide a diluted gas sample to the gas analyzers and data reduction equipment. Where fugitive dust emissions are a concern, regulating agencies are beginning to require ambient dust monitors. These monitors are placed at the edge of an institution's property to measure fugitive dust in the sub-10-micron range that may escape the site. Economizers must be operated above the gas dew point to avoid condensation of flue gas on the economizer tubes and to prevent external corrosion. To prevent internal corrosion caused by dissolved oxygen, water to economizers generally is deaerated. Air heaters recover heat from the flue gas by warming combustion air before it enters the boiler. Air heaters can be either recuperative (tube type) or regenerative (rotary type). In older plants without air heaters, a chimney of sufficient height will produce enough draft to maintain negative pressure in the furnace. When air heaters are added to these structures, an induced draft fan must be used to overcome the airflow restriction introduced by the air heater. Air heaters typically are placed after the economizers in the flue gas flow. An ideal air heater design would reduce the gas temperature to near but not below its dew point (i.e., the temperature at which moisture begins to condense out of the gas). Operation below the dew point will cause excessive corrosion from acids formed from sulfur products in the flue gas. The water supplied to the boiler is termed the feedwater. Feedwater heaters may be used with boiler systems that supply extraction-type turbines to increase the overall plant cycle efficiency. Feedwater heaters are heat exchangers that heat the feedwater with steam extracted from the turbine or with the turbine exhaust. The two basic types of feedwater heaters are the closed feedwater heater, in which the heat is transferred by means of a shell and tube-type exchanger, and the open feedwater heater, in which the water and steam are mixed to accomplish feedwater heating. Deaerators are most commonly the open type. Typically, a rise of 10°F in feedwater temperature will result in approximately a 1 percent savings in fuel consumption. Boilers used for heating systems can operate at or near the saturation temperature of the steam (i.e., the temperature at which the water is vaporized and the water and vapor are in equilibrium). However, steam supplied to turbines must be well above the vaporization temperature to maximize efficiency and prevent damage to the turbine blading from condensation. The temperature of the steam is raised above its saturation point in a method called superheating. Superheat sections in the boiler raise the temperature of steam taken from the drum to the desired superheat temperature. Superheat temperature will vary according to load, and the characteristics of radiant versus convection superheaters are distinctly different. Radiant superheaters absorb heat by direct radiation from the flame but exhibit a drop in steam temperature as load increases. Convection superheaters outside of the radiant portion of the boiler will experience a steam temperature rise as load increases owing to the increased mass flow of gases within the boiler. To control these temperatures and deliver consistent steam quality to the turbines, desuperheaters must be applied. Desuperheating is accomplished by spraying pure water into the steam so that the steam temperature is lowered to the desired point. Proper application of a desuperheater can control the overall steam temperature and quality. Desuperheaters may be applied at the exit of the boiler or between boiler superheater sections. The concentration of impurities in the boiler increases with operation because of system leakages and impurities in the boiler makeup water. To keep impurities at an acceptable level, it is necessary to remove water concentrated with impurities from the boiler, a process called blowing down the boiler. This blowdown is accomplished by a combination of periodic and/or continuous removal of water from the boiler system. Removal is typically done from the steam drum or drums and the downcomer areas of the boiler. The amount of heat lost during blowdown tends to be high, so a blowdown heat recovery system is often used and easily justified. Heat from boiler blowdown water is recovered by routing to a heat exchanger through which feedwater is flowing. In addition, low-pressure steam from the flash tank may be used to supplement extraction steam and other steam requirements of the plant. Complete, or 100 percent, combustion is not possible. A certain amount of unburned carbon in the fly ash will be entrained in the flue gas exiting the boilers. Carbon content of the fly ash ranges from 1 to 20 percent. This carbon loss can dramatically affect the overall efficiency of the boiler system. Ash reinjection involves capture of this fly ash and the corresponding unburned carbon for reintroduction into the combustion zone. Two common points of ash collection for reinjection are at the bottom of the economizer section and at the discharge of the mechanical collector. Previous discussions have centered on auxiliary equipment that may be added to the basic boiler system to increase overall system efficiencies. A fireside approach also may be used to increase efficiency, particularly when fuel oil and coal are used. Because these fuels are not homogeneous in nature, variations in combustion characteristics can be anticipated because of impurities and physical characteristics. Combustion additives help oxygen react with the combustible elements of carbon and hydrogen in the fuel. Combustion catalysts increase the reaction rate between the carbon and oxygen and lower the reaction temperature; thus, more carbon is burned at a given excess air level. This increased carbon utilization directly increases overall boiler efficiency. When fuel oil is burned, oil additives may be used to dissolve and disperse complex hydrocarbons that can interfere with the combustion process. An additional benefit of combustion additives is that particulate emissions may actually be reduced, since unburned carbons often make up a significant portion of the particulate emission from a unit. In particular, stoker-fired boilers often show decreased particulate emissions with the use of combustion additives. Steam turbines receive high-pressure, high-temperature steam from the boiler and convert the thermal energy to mechanical (shaft) energy, which can then drive a generator, chiller, fan, etc. The steam passes through nozzles, giving it a high velocity, then impinges on the turbine blading to rotate the turbine shaft. The conversion process involves pressure and temperature reductions as thermal energy is converted to mechanical energy. 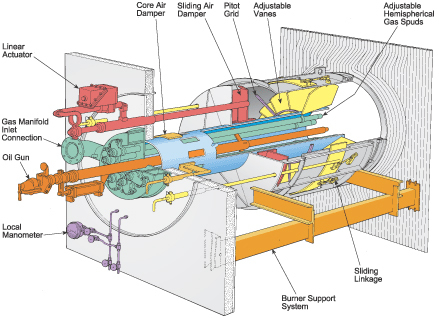 The steam expansion process can be in several turbine sections connected to a common shaft. Where: T = inlet temperature and T2 = outlet temperature (temperatures in absolute [degrees F + 460]). The larger the change in temperature (T1 -T2), the more efficient the engine. The change in temperature can be increased in two ways: by increasing the inlet temperature and pressure and by lowering the exhaust temperature and pressure. Raising the inlet temperature and pressure requires alloy steels to withstand the higher temperatures and pressures and more elaborate piping arrangements, insulation, pump capacities, and feedwater heating to avoid boiler stresses. Lowering the exhaust temperature and pressure is generally more feasible. However, steam should not be allowed to condense in the turbine. For example, reducing the turbine exhaust pressure from atmospheric (approximately 15 psi) to 5 psi would improve efficiency by almost 6 percent. This is the principle involved in a condensing turbine, discussed below. Technically, a back-pressure turbine exhausts at or above atmospheric pressure. The inlet temperature and pressure are relatively high, although they operate over a wide range of conditions. A typical use is in cogeneration, where the turbines exhaust into a steam distribution system that supplies the campus thermal requirements. In a condensing turbine, the exhaust is condensed, lowering the pressure to 2 to 5 psi. The treated feedwater is retained, collected in a hot-well, and pumped back to the boiler. Configurations where steam is extracted after one of the turbine stages to meet campus thermal loads are termed controlled extraction units. If all steam is condensed in the condenser, the unit is termed a straight condensing unit. Combustion turbines are popular as prime movers of electrical generators. They have the benefit of short lead times and low capital cost. Gas turbines come online quickly (less than 10 minutes) and can offer an excellent solution to backup power requirements or for peak shaving to limit electrical demand charges. Natural gas and fuel oil are typical turbine fuels. Gas turbines range in size from several hundred kilowatts to several hundred megawatts. The basic gas turbine has three main sections: compressor, combustor, and turbine. The compressor draws air in from the atmosphere, pressurizes it, and introduces it to the combustor. Fuel is added and burned in the combustor, and the hot gases are allowed to expand through the turbine section. Increased efficiency can be developed by adding a regeneration (air heater) section, an intercooler (split compressor and cooler) section, or a reheat (split turbine and second combustor) section. Another method to improve gas turbine system efficiency is the combined cycle plant. The combined cycle plant routes the hot turbine exhaust gases to a boiler section to extract additional thermal energy and generate steam. Typically, an auxiliary fuel is used in the boiler to promote complete combustion and to control steam temperature. The only pollutant of concern with gas turbines is NOX. Gas turbines can be high NOX generators, and some method of control usually is required. Control methods include water or steam injection into the combustor to keep flame temperature low and the use of selective catalytic reduction. Steam injection also will increase power from the turbine by boosting the mass flow through the turbine. Selective catalytic reduction consists of injecting ammonia into the exhaust stream. When there is not enough connected load to use all the steam produced, the use of a condenser may be required. Once-through cooling. The water is pumped from a source such as a lake or river, through the heat exchanger, and back to the source. The discharge must be sufficiently removed from the source to avoid heating it. Cooling pond. Water from the condenser is discharged into a pond from which heat is transferred to the atmosphere by evaporation, convection, and radiation. Spray pond. The water is sprayed 5 to 10 ft. in the air. Spray ponds require only about 5 percent of the area of a cooling pond for the same heat transmission. Spray ponds sometimes are used to supplement cooling ponds during hot weather. Natural draft evaporative cooling. This method employs a cooling tower with water sprayed counter to the airflow. Natural draft cooling requires large structures and therefore carries high construction costs. Mechanical draft evaporative cooling tower. These can be either forced draft or induced draft towers. They have a lower construction cost than natural draft cooling towers but require large quantities of water, which causes high operating costs. Dry cooling towers. These can be either direct, in which the steam from the turbine condenses in finned tubes in the cooling tower, or indirect, in which the heat from the turbine exhaust is transferred to a second fluid that is then pumped to the cooling tower. A sound chemical treatment program is essential to protect the large capital investment associated with a centralized heating plant. Boiler water must be treated to lessen scale formation, corrosion of metal, and carryover of solids. Scale will lower the thermal efficiency of the unit, and corrosion will decrease its life while increasing outages caused by tube failures. In addition, solids carryover will damage equipment, particularly steam turbines, when the contaminated steam enters the turbine blading. Pure water is an active solvent that will pick up or dissolve part of everything with which it comes in contact. The average level of impurities in Midwestern U.S. water is about 500 parts per million (ppm), or about one-half pound of residue for every 1,000 lbs. of water that has been evaporated. In Ottawa, Ontario, Canada, the water impurities content is only 40 ppm, which lowers the cost of water treatment. These impurities can cause scale, corrosion, and carryover within the boiler itself. In the past, most boiler feedwater was treated with phosphates until the development of chelant and polymer-type chemicals. These chemicals condition the calcium and magnesium in the feedwater so that these impurities will remain in suspension to prevent scale formation on boiler surfaces. Most boiler feedwater systems also contain a deaerating feedwater heater, which removes oxygen and dissolves gases from the feedwater. If additional oxygen scavenging is desired, chemicals such as sodium sulfite and hydrazine are added. A good boiler internal treatment program includes the addition of hardness-controlling and degassing chemicals with a blowdown system to discharge concentrated solids from the boiler's lower regions. Centralized heating plants with associated boiler supply water, condenser cooling water, and chilled water systems consume large amounts of water. Many municipal water systems cannot cope with this large water demand, so heating plants must operate their own water treatment plant. A water plant provides a source of potable water for use in the boiler, cooling tower, chilled water system, and other uses. Depending on the raw water source, a wide variety of equipment and systems may be used to develop potable water. This potable water is used directly in chilled water and cooling tower systems, but additional processing equipment such as condensate polishers, zeolite softeners, or demineralizers are needed to further purify the water for use in the boiler. A variety of equipment is used to produce a potable water supply from raw water sources such as wells, lakes, and rivers. Although the system equipment and configurations may vary dramatically, the principles of operation are the same. The primary processes are clarification and sterilization. Clarification is the removal of suspended matter and color from the water supply. The suspended particles may be removed with settling basins, filters, or coagulating chemicals. Many systems involve several or all of these. Water plant design is dependent on the raw water source, the desired potable water quality, the design and emergency flow rates, and the available equipment space. Water treatment plants may include such equipment as aerators, flash mixers, flock tanks, settling basins, clarifiers, lamella filters, gravity filters, pressure filters, and a variety of chlorinators and chemical feed equipment. Sterilization is the process of controlling the level of microorganisms in the potable water to a point lower than the local regulatory standards. Sterilization is generally accomplished with chlorine. Both maximum and minimum chlorine residual levels will apply to most potable water systems. Large power generation plants often use condensate polishers to further remove impurities from the condensate flow from the turbine generators. University systems employing steam export systems must cope with the return of condensate from remote building systems and significant lengths of distribution piping, all of which add impurities to the returning condensate. For these systems, condensate polishers are generally used to clean the campus condensate return water before the reintroduction of this flow into the boiler. Most condensate polisher systems incorporate a mixed-bed design with ion-exchanging cationic and anionic resins in a deep bed configuration. Bed depths vary from 2 to 6 ft. Condensate polishers can effectively control contaminants such as iron, copper, sodium, chloride, silica, calcium, and magnesium to significantly improve water quality in the heating plant cycle. Potable water does not provide satisfactory water for use in the boiler itself because of the solids dissolved in the water. Zeolite softeners may be used to soften the water source by removing scale-forming solids. A sodium zeolite system softens hard water by exchanging the calcium and magnesium for sodium. This softener consists of a vessel containing a bed of zeolite resin that attracts the hardness from the water as the water percolates downward. When the sodium charge is exhausted in the bed, the bed is regenerated. This is accomplished by rinsing the resin bed with a solution of ordinary salt, which is rinsed out, rendering the softener ready for another cycle of operation. This system of softening is relatively simple and economical to operate, since ordinary salt is used as the regenerate material. One drawback is that this method produces water with a high alkaline content that must be corrected chemically. Demineralizers also may be used to soften water for the boiler. In the demineralizing process, the water is passed through both cation and anion exchange resins to remove the scale-forming impurities. These positive- and negative-charged ion beds trap the impurities and allow only pure water to leave the system. When regeneration of the resin bed is required, the cationic resin is washed with an acid solution, and the anionic resin is washed with a caustic solution. Demineralizers are available in two configurations: mixed bed and dual train. In the mixed-bed system, the anion and cation exchange resins are contained in one unit. In the dual-train system, separate beds exist for the anion and cation resins. The main advantage of demineralization is its ability to produce better quality water than can be obtained by any other method. The initial capital cost is significantly higher than for other methods. A word of caution: This water should not be used for other applications because of its high mineral scavenging characteristics. Reverse osmosis is another method to pretreat boiler water and remove impurities. This process utilizes a membrane that is selectively semipermeable (i.e., open to the passage of fluids). This membrane allows only the desired ions to pass between two chambers. It has high internal operating pressures of 300 to 900 psi to overcome osmotic pressure and concentrate dissolved solids on one side of the membrane, thus filtering out impurities. This type of system generally is more costly to operate and install than a comparable demineralizer. However, chemicals are not required, and fewer waste products are generated. Combustion controls have two purposes: to adjust the fuel supply in order to maintain the required steam flow or pressure under varying loads and to maintain the optimum ratio of combustion air to fuel. There are three basic control systems: on-off, positioning, and metering. On-off control is regulated by a steam pressure-switch. When the pressure drops to a preset level, fuel flow is increased, and operation continues at a constant firing rate until the pressure rises to a preset level. This type of control generally is used only for fire tube and very small water tube boilers. Fixed positioning. A single actuator moves both the fuel and air controls to preset positions through mechanical linkages. This system cannot compensate for changes in fuel or air density or fuel supply pressure, so controls are normally set for high excess air to guard against dropping below the minimum excess air requirements. Parallel positioning with operator trim. Pneumatic or electronic positioning of fuel and air supply controls are actuated by a single pressure controller. A combustion guide is required to enable the operator to position the excess airflow. This is the most widely used type of combustion control for units rated at below 100,000 lb./hour. Pressure ratio. A parallel pneumatic or electronic system is used with the windbox-to-furnace pressure ratio to trim the fuel flow and airflow. Manual controls to change both the ratio of pressure and excess airflow are normally provided with a combustion guide. In a metering system, the fuel flow and airflow are metered, and the fuel supply and air supply controls are modulated in accordance with measured flows. This kind of combustion control is restricted to fuels that can be accurately metered. A refinement of this system is cross-limited metering, which limits the change in fuel flow through control logic to available airflow at all items. The airflow also is tied to fuel flow. The system can be further refined by using a continuously monitored flue gas analysis and by trimming the fuel-to-air ratio based on the oxygen content. This compensates for variations in fuel heating values and combustion air conditions. Currently, most boilers are controlled by microprocessors. Software-based systems offer controls that are flexible, responsive, dynamic, and easily tuned to match system requirements. However, there is a tendency to incorporate more complex control strategies requiring more highly skilled personnel on site for design and maintenance of the systems. The rewards often are realized in higher system efficiencies and fewer forced outages. An older boiler often can be made 1 or 2 percent more efficient by retrofitting a microprocessor control system for the pneumatic or analog-type controls already in place. Cost recovery can occur quickly when fuel budgets range in the millions of dollars per year. Before the start of each heating season, all steam and hot water generators should be performance tested after the completion of an annual water side, fire side, and control system maintenance and inspection. This performance test will provide the operator with a basis for assessing future operating efficiencies during the high fuel consumption heating season. With the performance test as a base, the operator can best monitor central heating system performance through regular review of fuel-to-steam conversion efficiencies. If this efficiency begins to deteriorate, the operator should investigate further to determine the reason for the lost efficiency. Attention should be given to stack gas analysis to determine if excess air levels are being maintained within the desired limits. System water makeup quantities should be evaluated to determine whether system losses are excessive. Stack gas temperatures should be reviewed to determine whether soot blowing intervals are adequate and whether the water treatment program is maintaining adequate water side cleanliness. Operating personnel must be provided with adequate instrumentation to monitor plant operating efficiencies continuously and accurately. Operators must be furnished with concise written operating instructions that indicate control limits for various plant-operating parameters. Hourly rounds should be made to record plant machine status, operating temperatures, operating procedures, and all meter readings where flow rates are available. If continuous indication of stack gas oxygen content and boiler water condition is not provided, stack gas and boiler water should be manually analyzed and recorded at least twice each shift. It is important that plant supervisors continually reinforce the necessity of routine and accurate recording of plant-operating parameters. These records will serve a vital role in assisting the facilities manager to identify the cause of any loss in plant performance efficiencies. Plant auxiliary equipment should also be subjected to annual performance testing. Pump and drive efficiencies should be tested and compared to manufacturer's data. Deaerating feedwater heaters should be tested to ensure complete oxygen removal. (If an oxygen scavenger is fed prior to the unit, feed must be discontinued before testing.) All operating instrumentation and controls should be calibrated and adjusted to original specifications. Steam trap function should be verified and valve packing replaced. Valves should be checked to validate their shutoff capability and overhauled when necessary. Makeup water softeners should be tested to determine whether mineral removal meets original specifications and whether resin is cleaned or replaced when needed. Auxiliary heat exchangers such as boiler feedwater heaters, vent condensers, and boiler blowdown heat exchangers should be cleaned and inspected. Stack gas cleanup systems such as mechanical collectors, electrostatic precipitators, bag houses, and sulfur dioxide removal equipment should be serviced in accordance with the manufacturer's recommendations. Retrofit economizers are available that are compact and designed to replace a section of boiler exhaust ductwork. Care should be exercised in specifying economizers to ensure that stack gas temperatures will not be too low during light load operation, which could cause condensation and corrosion. Gas and oil burners are available that will operate at excess air levels as low as 3 percent and have good turndown. Some burners are available as packages complete with burner management systems and forced draft fans. This packaging simplifies installation in existing facilities and can substantially reduce costs. 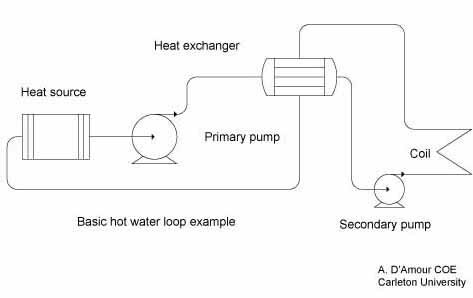 Boiler blowdown heat recovery can be accomplished with the installation of a small heat exchanger to transfer heat from boiler blowdown to boiler water makeup. Another method employs a pressurized flash tank connected to the plant exhaust steam system. 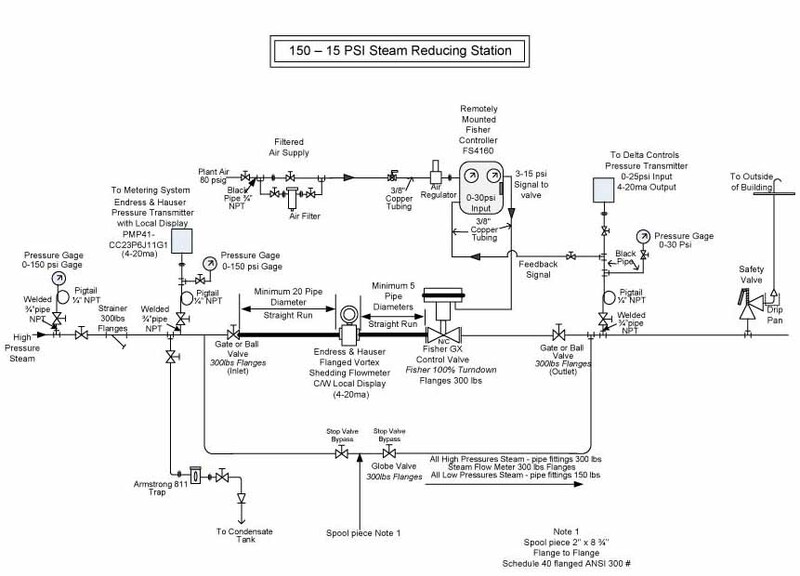 In this system, boiler blowdown is directed to the receiver, where it flashes to steam; thus, a portion of the waste heat is recovered as low-pressure steam. Automatic blowdown controllers are also available that monitor boiler water conductivity and automatically adjust boiler blowdown; thus, minimizing heat loses when compared to the conventional manual blowdown system where the operator manually regulates the duration of the blowndown for TDS control. Microprocessor-based controllers are available that will substantially outperform older control systems. They can also include economic dispatch that causes the system to automatically adjust loading on combustion equipment to maximize efficiency for any given load where multiple boilers are in service. Oxygen trim control and multi-element boiler water level control are also available. If oxygen trim control is installed on boilers that operate with negative furnace pressures, care must be taken to ensure that carbon monoxide is not present in the flue gases at low oxygen levels. This is necessary because boiler casing leaks will introduce air into the furnace downstream of the combustion process. This air will be detected by the flue gas oxygen sensor and cause the controls to reduce airflow. Incomplete combustion will result. Adding insulation to piping will also improve efficiency. In large distribution systems with low summer loads, the addition of small local steam or hot water boilers may allow complete shutdown of the central heating system and result in substantial savings. These shutdowns will also allow for comprehensive maintenance to be performed on the entire system in an orderly fashion. With variable fuel prices, many or all of the above retrofits may not be economically feasible. However, the facilities manager should thoroughly investigate all retrofit options and implement the most feasible ones in order to keep minimizing operating cost of the facilities. Central heating plant equipment maintenance intervals can be scheduled and tracked through a larger facilities preventive maintenance system or through a smaller system that serves only the central plant. Regardless of the maintenance scheduling system used, a detailed history should be maintained for all major equipment. This history should contain the original equipment specifications, parts ordering information, year installed, when service was performed, details on repairs, and parts replaced. This information will be useful in determining service interval requirements and in deciding whether a piece of equipment should be repaired or replaced after a major breakdown. Major pieces of equipment such as boilers, turbines, chillers, and heat exchangers should be inspected thoroughly on an annual basis. Checklists should be developed for each overhaul to coordinate activities and to ensure that items are not overlooked. Major overhauls should be scheduled based on unit condition, operating hours, idle hours, and startup-shutdown cycles. Major overhauls can be anticipated every 3 to 5 years for solid fuel boilers, every 7 to 10 years for gas-fired boilers, every 5 to 6 years for turbines, every 5 to 7 years for chillers, and every 10 years for cooling towers. Depending on service conditions, large pumps may need rebuilding every 7 to 10 years and large fans every 10 to 15 years, depending on air or gas conditions. Other auxiliary equipment should be reconditioned based on the operating and maintenance history experienced at the individual plant. Many plants do not have the staff or equipment to perform all of the maintenance activities required for a central plant. Some of these tasks are not worth the investment in in-house training and the required specialized equipment, since the frequency of these tasks is very low. Many plant managers rely on outside contractors to perform specialized or nonroutine tasks. Some of the tasks that plants contract out include vibration analysis, code-type pressure vessel welding, application of specialized coating systems, refractory repair, instrument calibration, protective relay calibration, stack lighting system repair, stack gas monitoring equipment repair and calibration, water treatment, major equipment overhauls, seasonal maintenance, metal fabrication, and machining. The maintenance requirements of any plant necessitate a wide variety of skills and specialty equipment. Maintaining a proper mix of in-house equipment, skills, and personnel supported by specialized outside contractors is difficult. When inside and outside skills are combined effectively, the university will be rewarded with lower costs for utility services and higher reliability for all utility customers. The operational staffing requirements of a central steam or hot water production facility are driven by a number of factors. A major consideration is the complexity of the system and the physical layout of the production facility. In complex systems that encompass central cooling and electrical production as well as central heating, larger operating staffs will be required than for a central heating-only facility. In facilities that burn solid fuel, staffing requirements will increase owing to the operation of fuel and ash-handing systems. Not only will this schedule limit each operator's workweek to 40 hours, it will also provide a relief operator. The relief operator can be used to fill shift vacancies, provide plant cleanup services, or support maintenance activities. If fixed shifts are used, one variation would be to rotate each operator sequentially into the relief position, with the charge arranged so that the relief operator moves into the schedule at the beginning of swing shift duty. This variation will allow all operating personnel to share equally in the burden of the relief role. Maintenance staffing will also be driven by system complexity and the scope of central services provided. However, the facilities manager has considerable flexibility in determining how these services are provided. At one extreme, all central plant maintenance and repair services can be furnished from central shops not organizationally under central plant management. At the other extreme, all central plant and distribution maintenance and repair can be performed by dedicated staff under the line management function within the central plant organization. The facilities manager can best determine which maintenance functions should reside in the central plant organization and which should be provided from central maintenance shops by carefully examining work hour and craft requirements to perform annual maintenance tasks. In the United States, requirements vary from state to state and even at the municipal level. In Canada, plant staffing is legislated and operators have to be certified for the province in which they are working. Operating engineers have to follow a curriculum of studies and a period of qualifying time as defined in the Technical Standard and Safety Act. The chief operating engineer has to sign off on the incumbent's qualifying time. Then the operating engineer can write the Provincial Qualification examination. By fulfilling these conditions and obtaining the minimum passing mark of 70 percent, the operating engineer can earn a Qualifying License. All the provinces are working toward a Canada-wide certification, bringing all their respective acts to a same standard. Once this is accomplished, one license will be valid across Canada. Check all equipment under supervision, such as water systems, fuel supply systems, boilers operation, chillers operation, air compressors, and all ancillary equipment. Adjust system to meet requirement in load variances. Report and record all anomalies during the shift in appropriate log book. Shut down and start up equipment as required. Perform water analysis and adjust chemical system to meet operating parameters. Make sure the plant is running in a safe condition according to rules and regulations. Additional staffing is required for maintenance function of the various systems such as air conditioner mechanic, plumbing and steam fitting, maintenance mechanics, electricians, control technicians, sheet metal workers, and certified high-pressure welders. Relief Boiler Operator: 7:00 a.m. to 3:30 p.m.
Epstein Clean-up and Relief Shift: 7:00 a.m. to 3:30 p.m. Break: 9:00 a.m. to 9:15 a.m. Lunch: 12:00 p.m.to 12:45 p.m. Break: 9:00 a.m. to Lunch: 12:00 p.m. to 12:30 p.m. The facilities manager must put in place and maintain an in-house training program to achieve two important objectives. The first is to maintain and improve the skills of existing operating staff. This skills maintenance and improvement program should include regular review of operating procedures, actual exercises in operating the plant in various configurations that would be necessary in the event of equipment failure, changing over to an alternative fuel, review of chemical handling and spill containment, and precise instruction on newly instituted plant operating procedures. The second is to train entry-level employees in the operation of the central plant to ensure a ready resource of replacement operators in the event of staff variances. A similar program should also be implemented to cover the maintenance functions performed by in-house staff. Some maintenance training can be provided by representatives from equipment manufacturers of various plant equipment and can be held onsite to reduce costs. Regardless of plant size, an effective, regular training program is a cost-effective approach to furnishing reliable and efficient central heating. Identify work unit training needs. Communicate regulatory changes and plans. Assist managers in their roles. Facilitate a monthly training meeting with manager. Schedule and conduct respirator fit testing. Coordinate purchase of safety equipment. Help with monthly workplace inspections. Maintain safety equipment records of inspections. Communicate activities to all personnel. Bender, Rene J. "Steam Generation: A Power Special Report." Power, June 1964 (entire issue). NALCO Chemical Company. 1979. The NALCO Water Handbook. New York: McGraw-Hill. Ontario Government: Technical and Safety Act of 2000. Ontario, Canada. Singer, Joseph G., ed. Combustion: Fossil Power Systems, third edition. Windsor, CT: Combustion Engineering, 1981. Steam/Its Generation and Use, 38th edition. 1972. New York: Babcock & Wilcox.